Tokyo Gas has been working on popularizing the use of natural gas vehicles (NGVs), which are clean and feature low CO2 emissions. Along with this effort, we are now laying the foundation for hydrogen supply, including technology development, in the hope of also popularizing fuel cell vehicles. About 47,000 NGVs were in use in Japan as of March 2018. 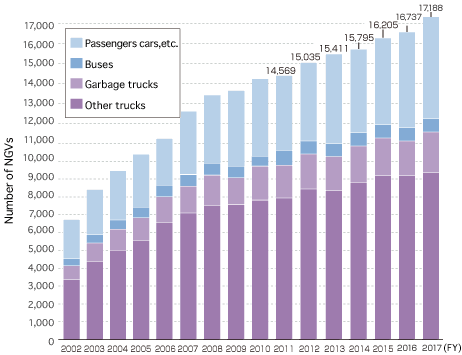 In our service area, 451 NGVs, mainly freight trucks and garbage trucks, were introduced in fiscal 2017, and 17,188 NGVs were in use as of the end of March 2018. A total of 73 natural gas stations operate in our service area, including 13 dedicated for collection and delivery vehicles. 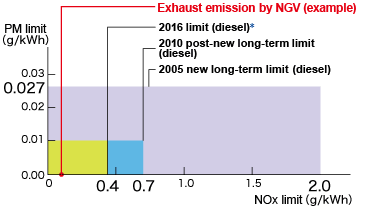 NGVs, fueled by natural gas instead of diesel or gasoline, emit only small amounts of nitrogen oxides (NOx) and little particle matter (PM) and sulfur oxides (SOx). They release about 10%–20% less CO2 emissions than gasoline vehicles and are touted for their environmental friendliness. *Diesel limits are for diesel vehicles weighing over 3.5 tons GVW. The environmental friendliness and superior energy security of NGVs make them a highly viable alternative to gasoline vehicles, and freight trucks, buses, garbage trucks, vans and other NGVs are already in widespread use on urban roads. With fuel diversification required for long-distance, inter-city trucking, Isuzu Motors Limited released a new heavy-duty compressed natural gas (CNG) truck in December 2015 and expanded its product line. Efforts are going on throughout the logistics sector to reduce CO2 emissions and diversify fuels.